The studs are concentric to keep the rockers, push rods & valves in alignment. No jam nut is required. Simply tap the boss & screw in the studs. 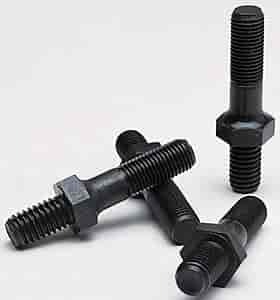 For 7/16''-14 threaded hole in head with shoulder for jamming, use with 3/8'' sure-lock adjusters. 7/16''-14 tap required. Does Mr Gasket 1074 fit your vehicle?